Monks & Navy & Pirates, oh my! Avast me lads and lasses. 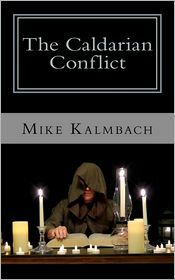 If it's a pirate tale ye been seekin', Mike Kalmbach's debut novel, The Caldarian Conflict will whet yer appetite. Caldaria is plagued by pirates. Admiral Cain of the Caldarian navy has come up with a plan not only to rid the sea of pirates, but also alleviate the streets of the dregs of society. Unfortunately, for all concerned, it boils down to murder. And more unfortunately for Admiral Cain, there's one monk not afraid to stand up against him. Brother Mendell is a monk devoted to Lord Justice (there are a number of different Gods and each monk must decide which one he/she will choose to follow as their life's path). Father Ramsey asks him to help a pirate, condemned to the hangman’s noose, come to terms with death and to find peace. Mendell accepts this pirate's last wish to find out how his captain, Shannon “The Cannon” O'Connor, was defeated. So begins Brother Mendell's journey for the truth. The Caldarian Conflict is a fast paced action/adventure/mystery/fantasy with a satisfying number of subplots to keep the reader guessing and plowing ahead for answers. At first I was afraid the entire novel would be spoken in piratese (the prelude takes place on a pirate ship – Kalmbach even throws in a couple of arrgs), but that language is used sparingly, and only gives personality to the pirates. Some pirates are even educated and use proper English when on land – a nice touch. It's been a lot of years since I read a pirate novel and what I really enjoyed about The Caldarian Conflict is how it is not a book where the plot is strictly good vs. evil. There are a lot of dimensions here. With maybe one exception, none of the characters are truly all evil, nor are they all good. Many of the pirates have redeeming qualities. Admiral Cain is not a nice man, but he knows the consequences if he's exposed, is convinced the ends justify the means, and truly believes in what he's doing. In a semi-warped way I had to respect that. On the other side, a number of monks, including Brother Mendell, are not without flaws. One minor irritation (and it is a very minor irritation), is Kalmbach's use of inner dialogue. The story is told in multiple points of view and many times the reader is placed inside a character’s head and is told what they are thinking. In this reviewer's mind the vast majority of the time it isn't needed, and the times where it does advance the story, it could be better shown through dialogue or narration. But maybe that's just a pet peeve on my part. Caldaria is a land of magic and gods and pirates and politics. A lot of work and imagination went into this world, and Kalmbach did a great job making it fresh and original and suspending disbelief. Although The Caldarian Conflict is set up for a sequel (which I’m already looking forward to), I would love to see a prequel featuring Shannon “The Cannon” O'Connor. She deserves her own novel (hint hint). Thanks for such a wonderful review, David! Glad you enjoyed the book. Thanks again!